With a couple of hours to set up and play Hexblitz, I wanted a simple set-up to get to grips with the rules. Trebian and YesthatPhil took the Soviet 5th Army and 4th Panzer Division respectively. 4Pz has been facing of against 5th Army for the last 2 months of winter as the Germans concentrate on their problems around MOSCOW, and the Soviets build up the necessary offensive power in the region. The game set up is as above. In order to progress things, we adopted Ugo-Igo early on, until it became apparent that the card activated system was important. I had underestimated the importance of the defensive, static and moving state, which is why the game suddenly sprouted markers (and trees¹). Phil is very keen on markers being hidden, bringing his experience of Megablitz to bear. I am not keen on markers at all. Treb loves markers and cards, owning an impressive collection suitable for all occasions. For this game the red party balloons represented strength points and were removed when lost. White ones represented LOG points. By this time, we were using all the game systems, and had identified a few questions regarding who fights whom in a free-for all brawl. I suspect that Bob organizes attacks so that anyone who is going to do so attacks a target at the same time, commanded by an HQ in command radius. We were not quite as well coordinated as that, so had a few attacks going in piecemeal. That was the point where we learned that if you are going to be hit by several wavelets of the enemy, don’t be caught in flank or rear if you are not in a defensive position. At the close of the battle, the Germans had taken a heavy beating, but the Soviets had not captured LIPETSK (Липецк). The game probably only ran at half speed, so any comments about it being faster or slower than other systems are really not valid at this stage. There is more structure to Hexblitz than NQM, so gamers who like proper rules will really like Hexblitz and Megablitz. Players who want flexibility or a framework to hang house rules on will probably prefer NQM. I’m greatly encouraged by the run-through and will try it again, but we need to use fewer SPs next time (40 and 80 for defender and attacker was too ambitious for a first game). My first thought is that the rules are perfect for solo play, so I will solo a game next before inflicting my imperfect umpiring of someone else’s rules on other players. Having walked through the northern third of 2nd Alamein to see if the real estate fitted (it did), I worked through the head-to-head infantry attack of 44th Infantry Division against Folgore. The battle commenced with a divisional barrage that put serious disorganisation of 1/3 onto the dug in division (25pdrs M against dug-in infantry M). The infantry then followed this in, winning the firefight and evicting the first line of defences with 100% disorganisation in the close assault. I ruled that, being veteran, Folgore could immediately counterattack with its second line of defence, during the second close assault phase and pull its first line of defence out to reorganise. 44 Div were allowed to do the same in the third close assault phase, ending the turn. In future though, I shall restrict immediate counter attacks in the enemy’s turn to veteran troops. This produced a very satisfying to-and-fro battle that left both sides’ infantry at about 50% casualties, with all artillery ammunition exhausted by the end of 4 rounds of fighting. Infantry could not pursue beyond their one square range. Infantry could attack a diagonal square, but only if they were able to attack it orthogonally from the front or flank without interference from enemy on their own front or flank. In other words, they could not ignore an enemy to their front in order to concentrate an attack on an enemy to their diagonal front, and they can only do this because the one free diagonal move per game turn that they are allowed places the square they wish to attack in reach. The Devils Gardens sown around ALAMEIN were complex and wide ranging. Even today, tourist guides advise not straying off tracks, and this despite massive postwar clearance efforts. I should state that I don’t like mine warfare, possibly because part of my job involved training to lay them and actually digging up other peoples mines. They are however, a major part of the ALAMEIN battlefield, and they need to be modeled. Tradition dictates that a roll of wire wrapped around a Biro and stuck to a lollipop stick is the way to do it and Trebian takes this approach. I went for thin marine ply with sand PVA glued on top and sealed with acrylic paint in suitable shades. Some have mines and other items of interest on them. I went with 150mm (6″) strips to match the square sizes. Phase I: Operation Sonnenblume (6 February – 25 May 1941). The Germans drive the Allies east, isolate TOBRUK and on 10 April attack a largely Australian defence. The Australian infantry prove that a coherent infantry force behind well-sited concrete defences in three layers can contain a frontal armoured attack. Phase II: Two unsuccessful allied relief attempts ensue, Operation Brevity (15–16 May), Operation Battleaxe (15–17 June), before Operation Crusader (18 November – 30 December) relieves TOBRUK on On 27 November 1941. Phase III: Around TOBRUK itself, nothing happens for five months operationally. The Germans lack the strength to penetrate the defences and at the same time fight of the Allied counter-offensives. Phase IV: After TOBRUK is relieved, the garrison is changed (see below). Phase V: The Axis forces attack, and Tobruk falls in a matter of hours! Admin units have been omitted and are represented by supply dumps. All units may translate one diagonal move per turn. For example, infantry moving one square may always take it diagonally if they wish. units must still abide by rules governing entry to or exit from squares. Defences may sit entirely in one square or on the boundary of two, or four squares, controlling every square they sit in. They may be close assaulted in every square they are in, during the same move. They may receive fire from every unit that chooses to shoot at them from the same square or across a square boundary for longer ranged weapons. Defenders must choose who they are shooting against. Attackers must first win a firefight to close assault any square that a defender sits in. They must enter the square that the defender is in to do so. Defenders may have more than one line or position of defence in a square. Each line or position must be close assaulted and defeated to control the square. The Advance in Contact/Assault (A) rate is used for attacking troops who break into a position, or fight through an area forcing the defender to withdraw. The Road March/Rout (R) move rate normally only applies to Echelon or Transport and HQ units on good roads, or anyone fleeing or withdrawing from enemy contact. The lead fighting elements of a unit move at the Move to Contact (M) rate unless moving non-tactically on roads, in which case they move at the Road March/Rout (R) move rate. Happily, these Initials coincide with Tim Gow’s Megablitz “SMART” movement states and are expressed in Squares (but I haven’t felt the need to adopt Tim’s closed decision-making, nice though it is, as defenders can choose to stay or withdraw, unless forced to retire by morale. Defenders are only overrun if the attackers are more mobile e.g tanks or motorised troops overrunning infantry). * Further penalize movement for congestion etc. *Use the lower limit in close terrain and the upper limit in open. To make the recce sequence run even faster in the early part of the game, consider dispensing with the recce’s limit on movement, but only allow them to make ONE recce test per move. If the recce blunders into a hidden defender that it has not reconnoitred, it is ambushed and rolls at -1 to its normal modified score. This sequence is used for reconnaissance bases or stands (recce) and others coming up against a concealed enemy. The attacker rolls a Red die, the defender rolls a a Blue die. ROLL THEM BOTH AT ONCE. The recce can elect to look at a position likely to contain enemy, or the defender can shout STOP at a point where the recce is likely to be engaged, with any adjustment being made once the dice result is in the open. Advancing recce can only look at one area per move. This has the effect of forcing them to adopt a slow low risk advance, or a fast high-risk one. For those who ask, “why does recce not get a bonus?”, their advantage is speed. If you feel they are more skilled than infantry line troops, then upgrade their status accordingly. Compare the scores. The Highest wins. every point over +2 places a pin on the attacker. every point over +2 places a pin on the defender. Filed under "Rules" Explanations, 15mm Miniatures Wargames, NQM Squared, Rules Examples, The "Rules"
My MOSCOW model doubled as LENINGRAD with no alteration, but I am unlikely to need to model either city again in this campaign. Time for a makeover. I chopped the base up into smaller pieces, so that it can be used for smaller built-up areas, or even STALINGRAD, if I do it again as a set piece. For terrain pieces, I have nominally used 75mm and 150mm as sizes (3″ and 6″). This should make life simple when playing NQM Squared. Predictably, the buildings didn’t quite fit this grid. Late last night I was wandering around the back streets of modern VOLGOGRAD, and was struck by how little had changed. The factories are in largely the same places, and residents’ houses are crowded into rectilinear grids in much the same style as 7o years ago. I was also struck by how much open space there is around the city, and relatively speaking, how low-rise the city appears because of the wide boulevards between buildings. How much of this is post war remodelling, I don’t know. VELIKY NOVOGOROD sits astride the River Volkhov, at the northern tip of Lake Ilman. The Command decision Hex Grid Europa map runs a straight rail line between LENINGRAD and MOSCOW, and ignores this inconvenient piece of geography to put NOVOGOROD on the rail line. For this game, finishing the Soviet winter offensive, I put the city and rail lines back where They should be. 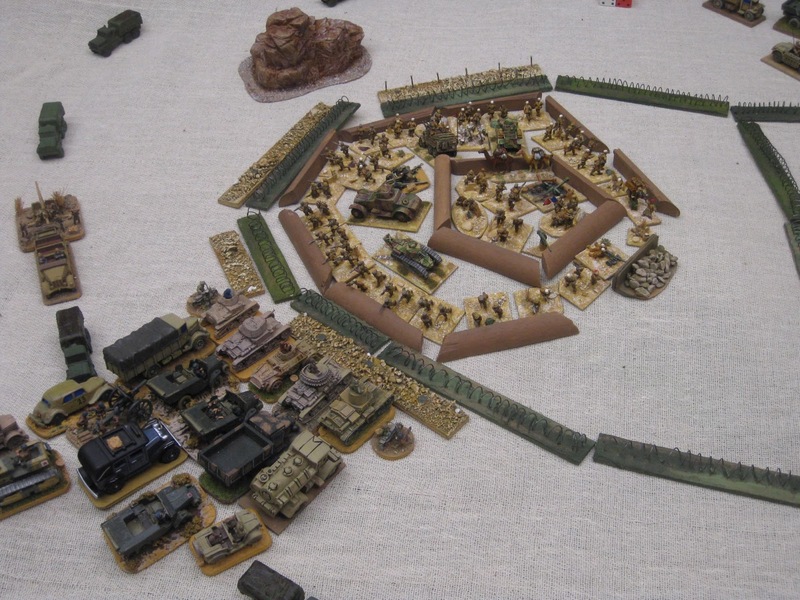 It was also the first outing of the new squared board, and a chance to see how a Wehrmacht Korps defence in depth fared against a Soviet army of 3 divisions. To the south, 126 Infantry Division held NOVOGOROD, and to the north, 30 Infantry Division held a line 9 km deep. Facing them was 34th Army with 31, 32 and 33 Rifle Divisions. As in Phil’s original game, we used Tim Gow’s Megablitz SMART counters to codify the tactical stance of the two sides, but we retained the NQM table 12 winning the firefight for resolving combat. Phil’s movement table was used. During the course of the game, 33 Rifle made no progress attempting to break into NOVOGOROD, contenting itself with demonstrating outside. 32 Rifle forced a crossing over the River Volkhov, and broke into the main line of 30 Inf, but was forced to withdraw as a spent force. 31 Rifle was more successful, with one of its regiments finding the northern flank of 30 Inf, and bypassing it. The Luftwaffe was more active than over LENINGRAD, and succeeded in driving off Sturmovik regiments and inflicting some damage on one of the river crossings, but failing to destroy either. They Couldn’t Hit a Barn Door at this Dist…. The month ended with NOVOGOROD surrounded but the Wehrmacht falling back in relatively good order until the Rasputitsa halted all movement in the north for a month. Allow attacks from troops that share a square edge in common, but not corners. Ranged support troops (artillery, AA) can be further back. Air assets can be placed on airfields or baseline at the start of the game. They must roll an appropriate number to activate a sortie (or perhaps get the first one free), then return to base and reactivate when they reach an appropriate score – perhaps reducing the number by one on each subsequent attempt, perhaps not..
Recce and Engineers show hits on their main (E3) or (R3) stand, but the markers can show where the actual effort is going in. How is ALAMEIN Shaping up? The collection of models for ALAMEIN (and later, Tunisia and Italy) is coming on nicely, but I’m hitting some hard limits on (a) storage space, (b) how much board space I need to lay ALAMEIN out, and (c) the sheer numbers of infantry needed . YesthatPhil previously posited that the players would be happier with a more formal game sequence and squares to help with directions (I believe the original armies had similar problems with maps and compasses), so there may be some mileage in going to NQM Squared.I’m still not a fan of rectilinear military thinking, but if it gets the job done, it’s a compromise that I’m willing to make. Phil has paved the way there with Megablitz Squared in an elegant blend of NQM and Megablitz, using PBI 6″ squares. In addition, the work that Bob Cordery has put in with The Portable Wargame concept has made squares much more acceptable to players. My initial sums on the back-of-a-fag-packet led me to believe that the ALAMEIN front of 40miles (65Km) could fit onto a 6.5m tabletop at 10cm per Km (1:10,000). Trebian’s Shedquarter table is 11 feet, or 22 x 6″ (150mm) squares. If the scale is halved to 1:20,000 then that makes a square about 3Km across. A battalion normally holds a frontage of about 1Km or 50mm. Megablitz divisions are roughly half the size or smaller than those in NQM, but I have been fighting the Eastern Front at between half and 1/3 scale anyway. It would make sense to write orbats for these army-level games that more accurately reflect what we are actually doing. This makes a lot of sense for 1943 onwards, where on the Eastern Front, the numbers of units increased along with their firepower, but the manpower shrank as the battlefield emptied in response to the increasing lethality of the weapons employed. The first simplification is to remove the distinction between support and fighting stands within the infantry battalion. If a battalion is now S3 instead of S6, this no longer matters. The support will sit at regimental level, and headquarters will sit at divisional level. I will need to make explicit the defence tactic of dispersed defence in depth to reduce the lethality of artillery barrages, whose main effect seemed to be to impose disorganisation on defenders, and disruption/delay on attackers with casualties as a by product. The German defenders at ALAMEIN do not seem to have suffered excessive casualties from a heavy set piece bombardment conducted to WWI standards of planning by a highly professional artillery arm, but it did stop thenm from interfering with minesweeping and the initial advance. Divisional supporting battalions such as Anti-aircraft Anti-tank and artillery will have to express their effect over the area of the division. squares should make this easier. This should free up time for logistic matters that are usually ignored when the combat becomes heavy. I have felt for a while now that I only need to track artillery ammunition and fuel for armoured divisions: no-one else ever really reported running out of stuff down at battalion level. Small markers that don’t really play a part in the came or occupy real estate can be subsumed into units – namely RMP and FOOs. Single figure markers may be useful here. The first stage is to play a trial game to make sure that the balance between infantry, armour and artillery is still intact. As the battle for LENINGRAD moved into the centre of the city, heavy guns from the captured icebound Soviet Fleet came into play. On the Soviet side, no fewer than three B-4 and B-2 regiments laid down a sustained bombardment of the shrinking German lines. This was the largest concentration of heavy artillery seen since the siege of MOSCOW. Engineers came into their own, with two bridges proving harder to demolish than their size would suggest. Rolling two successive ones didn’t help either! The LENINGRAD garrison continued to be pressed from the north, east and south. Soviet siege artillery pounded the centre of the City into rubble with no respite. The survivors that streamed out of the city were shell-shocked and reduced in numbers by 30-60%, And the attackers fared little better as General Zhukov fed more divisions into the meat grinder. The Commander of I Infantry Corps received a LittleFuhrer directive ordering LENINGRAD to be held to the last man. It was already far too late for that, so after ordering a breakout and fallback onto the Oranienbaum position, The Corps Commander joined the final few survivors clinging to the Docks area. He was last seen ordering the destruction of fuel oil and ammunition on the jettys, before being overwhelmed. The Soviets, too, were at the end of their resources, so consolidated their position against counterattacks. A final assault on ORANIENBAUM was repulsed. As the Rasputitsa began its thaw and ice on the NEVA broke up, an uneasy peace settled over the ruined city of LENINGRAD. The new bases speed things up by making it clearer which battalions belong where in attack and defence. I don’t quite know if I approve of the tidiness, but it makes things faster for the players, so that’s good. Engineers were vital in this game. Neither side had enough. Normally an engineer base is 1SP; I tripled this to 3SP and things were still tight. I ruled that breaching minefields under fire needed a 4-6 on 1d6 in the first turn, with an accumulating one reduction in second and third turns to 2-6 as a minimum die roll on subsequent rurns. We started by recording hits by placing a die next to the unit affected, then by placing pin markers at the end of a move. It helped to show the situation during attacks. It is easier to place pins on the new larger bases. The total playing time worked out at about 8 hours, with an hour at each end setting up and packing down. You are not imagining it if you think that the paint jobs on some of the units became more complete during the game. I took advantage of the layout to touch up a few of my own units during the intervals between games. I need more ambulances and radio trucks for both sides.